Identification. The origins of present-day Austria can be traced back to prehistoric times. The Danube River valley was populated as long ago as the Paleolithic Age (50,000 B.C.E. –8000 B.C.E. ). Austria was inhabited by Celtic peoples from prehistory until it fell under Roman control in the first century B.C.E. By the late second century C.E. , peoples such as the Slavs, Germans, Huns, and Bohemians began to raid Austria. Christianity, which became the official religion of the Roman Empire, had become established in the region by the end of the fourth century. Location and Geography. Located in south-central Europe, Austria is a landlocked, mountainous country, with an area of approximately 32,375 square miles (83,850 square kilometers). It shares borders with Germany, the Czech Republic, Slovakia, Hungary, Slovenia, Italy, Switzerland, and Liechtenstein. Its western portion is a narrow strip that extends between Germany and Italy. The Danube River, Austria's only navigable waterway, flows from southeastern Germany across northern Austria. Areas of major settlement are in the Danube valley and in the lowlands or hills north, east, and south of the Alps. Austria is divided into nine provinces, Vorarlberg, Tirol, Salzburg, Upper Austria, Carinthia, Styria, Burgenland, Lower Austria, and Vienna, the capital city and a major river port on the Danube. The Alps are the distinguishing physical feature of Austria, dominating the western, southern, and central regions of the country, with the highest point at Grossglockner, 12,457 feet (3,797 meters). Although the Alps usually did not demarcate the provinces' political boundaries, they were often impassable. Many inhabitants of Alpine valleys were thus isolated and developed their own distinct dialects, dress, folklore, and architecture, and could easily determine the origins of outsiders. Modern mass media and mobility have diminished many of these distinctions. Demography. The 1998 population count was 8,078,449 (2000 estimate, 8,131,111), about 95 percent of whom were ethnic Austrian. Other numerically significant ethnic groups include Slovenes, Croats, and Czechs. Austria has one of the world's lowest birthrates, and much of the population is under age twenty-five or over sixty-five. About 65 percent of the population is urban, the largest city by far being Vienna (1.64 million). Linguistic Affiliation. Austria is the only country other than Germany where the official language is German, and approximately 98 percent of the population speaks High German or a dialect of it. Austrian German sounds "softer" from that of Germany, and German speakers can easily discern the difference. There are also regional dialects of German, such as Weinerisch, spoken in Vienna. Austria's Slavic minority, located mostly in the south and the east, speak Slovenian and Croatian as their first language. English is taught in all schools as a second language. Symbolism. The black eagle on the Austrian coat of arms is the national emblem. The civic crown on its head represents Austria's middle classes; a sickle in its left talon represents its farmers; a hammer in the right, its artisans; and broken silver chains hanging from each talon represent freedom from Nazi German control. The red and white bars of Austria's national flag adorn its breast. These represent the blood-stained tunic worn by Duke Leopold V of Babenberg after the Battle of Ptolemais in 1191. Austria's national anthem is "Land of the Mountains, Land on the River." The edelweiss, Leontopodium alpinum, one of the most famous Alpine plants, is also widely associated with Austria. Celebrated in The Sound of Music, the edelweiss has white star-shaped flowers and grows on rocks and in crevices. Emergence of the Nation. Austria's geographical location at the crossroads of Europe determined its historical multiethnic makeup. In the late ninth century, Slavs and Magyars (Hungarians) advanced westward along the Danube River valley and overran the area. They were defeated by the German king Otto I at the Battle of the Lech in 955. Otto established a strong march (protective zone) along Germany's eastern border to keep tribes to the east at bay. Many German colonists settled in the region. Austria emerged as a distinct political entity in 976 when Otto II gave the area to the Bavarian nobleman Leopold of Babenberg, largely to keep the Magyars at bay. Austria flourished culturally and economically under the three-hundred-year reign of the Babenberg dynasty, who built great fortresses and beautiful monasteries. The Danube became an important trade route, and Vienna was made the capital. Roman Catholicism and German ethnicity took hold in the area. When the last duke of Babenberg died without an heir in 1246, the Holy Roman emperor Rudolf of Habsburg wrested control in 1278, marking the beginning of the 640-year Habsburg dynasty, one of the most powerful and dynamic in European history. The Habsburgs were extremely successful in expanding their empire through politically motivated marriages. The empire became so extensive that at various times it included Austria and surrounding countries, northern Italy, Spain and its American territories, and parts of Germany. By the seventeenth century, Austria was the foremost German state and a major European power. The dominant theme of Austrian history during this period was war, especially under threats from the Ottoman Empire during the sixteenth and seventeenth centuries. The Ottomans launched two great sieges of Vienna (1529 and 1683), but both failed and the Turks were repelled to southeastern Europe. With the death of Charles VI in 1740, his daughter Maria Theresa (r. 1740-1780) became ruler, although she had to fight off rivals to the throne. Reigning over a golden age in Austria's history, Maria Theresa ruled for forty years. Although she lost Silesia to the Prussians, she—and later her son, Joseph II (r. 1765-1790), who ruled with her jointly beginning in 1765—presided over Austria's transformation into a modern state. She established centralized control of the state, set up a civil service, introduced public education, expanded industry, and reformed the military and the legal system. The cultural life of Austria also thrived during this period. 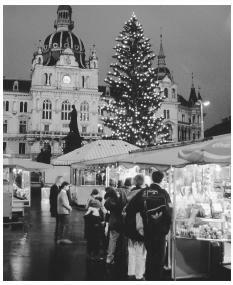 Customers explore the shops in the open-air Christmas Market at Hauptplatz in Graz. the end of the Holy Roman Empire and also a weakening of Austria. The French revolutionary government, in an effort to expand French territory, declared war on Austria in 1792 and began to capture Habsburg territory. Austrian emperor Franz II allied with Britain, Prussia, and Russia to fight the French. The conflict continued until the Congress of Vienna in 1814-1815, convened to plan a permanent settlement of European territorial boundaries. The congress created the German Confederation, a union of thirty-nine small German states with Austria in permanent control of the presidency. Austria also regained much of the territory it had lost to Napoleon. The provisions of the Congress of Vienna confirmed Austria as the dominant European power. Even after Emperor Franz Joseph I (r. 1848-1916) suffered defeat by the Prussians in 1866, losing some lands, what became known as Austria– Hungary remained a great power. On 12 November 1918, at the end of World War I and after the dissolution of the Habsburg Empire after the assassination of its heir, Archduke Franz Ferdinand, a new German Austrian state—known as the First Republic—was established. It was only about one-fourth the size of the Austro-Hungarian Empire. In March 1938, Nazi German troops occupied Austria, renaming it Ostmark and annexing it as part of Germany. This annexation was known as the Anschluss. Adolf Hitler enlisted Austrian soldiers in the German army until the end of World War II in 1945. After the war, Allied forces occupied Austria, which was divided into four zones. Nullifying the Anschluss, on 27 April 1945 they reestablished an independent Republic of Austria under its 1920 constitution as amended in 1929. Not until the State Treaty of October 1955, however, did the four Allied powers—the United States, Great Britain, France, and the Soviet Union—end their occupation of Austria. Austria's status as a neutral nation was incorporated into the constitution by the Federal Constitutional Law on Neutrality of 26 October 1955. National Identity. Although Austria during the Habsburg Empire was made up of many ethnic groups, the strongest group remained the Germans, and they considered themselves German by culture even though they were loyal to their provinces. During the late 1800s, Austrians began to support the nationalist ideal. Germans in Austria–Hungary divided into three political groups, called Lager (camps)—the German Liberals, the Social Democratic Workers' Party, and the Christian Social Party. After World War I, during Austria's First Republic, these camps grew stronger and more divisive, to the point of armed conflict by the 1930s. After the assassination of Christian Social leader Engelbert Dollfuss by Austrian Nazis, the Christian Social Party continued its regime under the leadership of Kurt von Schuschnigg. Following the Anschluss and then Allied occupation after World War II, Austrian political party leaders discussed ways to rebuild their country and overlook their political differences. After the Nazi war atrocities, Austria no longer wanted to be a part of Germany, and the rise of Communism in Eastern Europe made parliamentary democracy more attractive than ever. However, by 1956 only one-half of Austrians saw themselves as a nation, whereas 46 percent still identified with their German culture. By the late 1980s, nearly 80 percent of Austrians embraced their identity as a distinct nation. Ethnic Relations. Although the Austrian population is strongly homogeneous, there are sizable Croatian (in Burgenland), Slovene (in Carinthia), Hungarian, Czech, and Slovak minorities, and the preservation of their language and culture is guaranteed by Austria's constitutional law. During the late twentieth century, however, the number of Austrians declaring membership in their ethnic groups dropped by large percentages. Since 1945, Austria has accepted immigrants, refugees, and transmigrants seeking political asylum from Eastern Europe and the Soviet Union, as well as from South America, Iran, Uganda, and Afghanistan. Gypsies and Jews, who have lived in Austria for centuries, are also considered minority groups. Gypsies maintain much of their life of freedom, and as a result have not become a part of the larger society. Some anti-Semitism still exists in Austria, but attitudes changed somewhat during the 1980s and 1990s. After World War II, workers arrived from southern Europe, North Africa, and the Balkans to help rebuild northern Europe. Many are still considered "guest workers," although they and their families have made permanent homes in Austria. In 2000, immigrants made up 9 percent of Austria's population. Austria's political conservatives unjustly blame immigrants for taking jobs from native Austrians and for rising crime. Many foreign workers hold low-paying jobs and therefore live in poorer neighborhoods in urban areas, especially in Vienna. Because of widespread public concern about immigrants, the government tightened immigration controls and strengthened its border patrol in the late 1990s. Approximately one-third of the Austrians live in the five largest cities—Vienna, Graz, Linz, Salzburg, and Innsbruck—with the remainder inhabiting small towns and the countryside. Most urban dwellers live in four- or five-story apartment buildings, high-rise buildings, or single-family homes. Many rural areas are dominated by farmhouses that have been in the family for hundreds of years. Usually made of stone and wood, the farmhouses are often equipped with a bell tower to announce mealtimes to those working in the fields. Because of the Alps, Austrian farms are small and isolated, making production relatively expensive. Western provinces have wooden chalets with steep, pointed roofs, like those in Switzerland, whereas the eastern Danubian houses exhibit more of a Slavic influence, with simple design and stucco plastering. 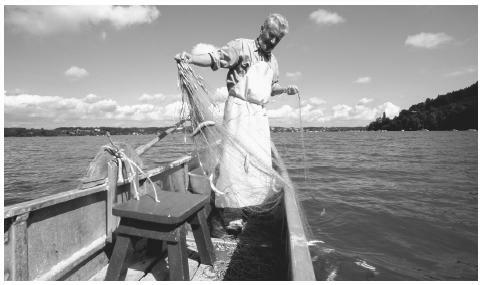 A fisherman in Attersee. While Austria is highly industrialized, traditional methods and customs are held in high esteem. have appeared throughout Europe's history, including the Romanesque and Gothic styles, most notable in churches and monasteries, of the Middle Ages. Other important historical styles include Renaissance, rococo, historicism, and modern. The church, the state, and the nobility celebrated the ascendancy of the Habsburgs with extravagance, exemplified in large-scale building. The Italian-inspired architecture of the baroque period reflects a combination of religious piety and worldly opulence. Austrian architects created a distinctive national style, Austrian baroque, that featured irregular or undulating outlines, dynamic use of bold and delicate colors, and rich ornamentation. Vienna achieved its modern-day look in the second half of the nineteenth century with the rise of a prosperous middle class. The medieval wall surrounding the city was razed, freeing up a large tract of land that resulted in the laying out of the Ringstrasse, a great boulevard enclosing the city on three sides (the Danube bordered the fourth). Reviving old architectural styles (historicism), architects and city planners erected buildings with a great diversity of retrograde styles, including Gothic, High Renaissance, and Greek. Architects in the early 1900s opted for the functionality of modernism, especially in public buildings and transportation systems. Vienna has been in the forefront in providing and maintaining public housing. After the 1960s, architects rejected functionality for illusion and sensualism, focusing on architecture as structures in which individuals "participate". "Plague columns" are a distinctive type of Austrian monument, erected in town squares throughout the nation in thanks to the Trinity or the Virgin Mary for deliverance from deadly plagues. Food in Daily Life. Austrian cooking is one of the most varied in Europe and includes German, Hungarian, Czech, and northern Italian influences. A typical Austrian's day begins with a light breakfast of coffee or milk with bread and butter or jam. Sausage served with mustard on a hard roll is a typical midmorning snack. Lunch is usually the main meal of the day and consists of soup and a main course of meat—sausage, the widely popular Wiener schnitzel (breaded veal), chicken, beef, pork or fish. Fresh vegetables, dumplings, noodles, or potatoes often accompany the main course. A salad may conclude the meal. Austrian city dwellers often take a midafternoon coffee break at a national institution, the coffeehouse. Part of the Austrian way of life, the coffeehouse serves as a meeting place and a source for breakfast or a snack or light lunch. Most coffee-houses, which usually also serve alcohol, have their own distinctive atmosphere. The evening meal usually consists of light fare, perhaps cold meats, cheese, or smoked fish with bread and wine or beer. Basic Economy. Before World War II, Austrian farmers produced 72 percent of the nation's food requirements. With wider use of commercial fertilizers, mechanization, and scientific methods, they steadily increased that percentage to 90 by the mid-1990s, even though less than 20 percent of the land is suitable for farming. Major crops are wheat and other grains, sugar beets, and potatoes. Austria also grows a variety of other vegetables and fruits, as well as grapes for making wine. Most farmers breed pigs, sheep, and dairy cattle, from which they obtain meat, wool, milk, cheese, and butter. With increased mechanization, the number of people employed in agriculture decreased, and by the mid-1990s about 7 percent of the population held agricultural jobs. Most farms are small and are owned and operated by families. Many farm families supplement their income by renting out rooms or serving as tour guides or ski instructors. Austria produces some petroleum and natural gas to meet its own needs, and it also mines coal, iron ore, copper, lead, zinc, antimony, and graphite, used in industry. Its rivers are harnessed to produce hydroelectric energy that provides a substantial portion of the nation's energy needs, with a surplus to export to neighboring countries. Abundant forests provide materials for lumber, paper products, and fuel. Conservation has helped protect farmland from landslides and erosion. Austria's basic unit of currency is the schilling. Banking and finance are also an important part of the economy. Land Tenure and Property. Austria's urban property market is weak, with many people renting rather than buying housing. Most farms are less than fifty acres (twenty hectares); nearly half are about twelve acres (five hectares) or less. About 70 percent of Austria's forest lands are privately held, with the remainder owned by the federal and provincial governments and by the Roman Catholic Church. Inherited wealth is more highly respected than earned wealth. Commercial Activities. Austria is highly industrialized, but expert craftsmanship is also valued and can be found in products such as leather goods, pottery, jewelry, woodcarvings, and blown glass. 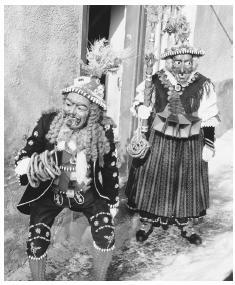 Costumed Austrians at a festival in Imst. Tourism contributes a substantial portion to the economy, especially ski resorts in the Alps and cultural attractions in Vienna and Salzburg. Agricultural products such as wheat, corn, wine, dairy products, and meat are also produced for sale. Major Industries. Manufacturing is the strongest sector of the Austrian economy, accounting for one-third of the workforce and about 40 percent of the gross domestic product. Iron ore is Austria's most important mineral resource, and metal and metal products, especially iron and steel, lead the manufacturing sector. Major products include motor vehicles, locomotives, heavy machinery and equipment, customized electronics, and tools. Other principal manufactured goods include chemicals, petroleum, graphite, wood and paper products, textiles, tobacco products, beverages, and processed foods. Trade. Germany is Austria's principal trading partner, with Austria importing crude oil, machinery and equipment, chemical and manufacturing products, pharmaceuticals, and some foods. Austria's major exports are machinery and equipment, electronics, paper products, clothing and textiles, metals, and transportation equipment. Austria joined the European Union (EU) in 1995. It also conducts wide-ranging foreign trade with Italy, Switzerland, and other EU countries, as well as the United States, Japan, and other Asian countries. Division of Labor. Craftsmen serve as apprentices for several years before becoming journeymen and, finally, master craftsmen. Farming is done mainly by families who own the land. Immigrants from a number of nations are employed as unskilled labor and service industry workers. Professional, white collar, factory, and government jobs are held mainly by native Austrians. Classes and Castes. Austrian society was traditionally highly stratified, with well-defined social distinctions. In the early 1800s, the three major social classes were aristocrats, "citizens," and peasant-farmers or peasant-serfs. At the beginning of the twentieth century, a small aristocracy remained, along with a small middle class of entrepreneurs, a larger working class, and a large class of peasant-farmers (about 55 percent of the population). During the period between World War I and World War II, these classes developed separate political affiliations as well, dividing the people into camps based on beliefs in either social democracy, conservative Christian politics, or liberalism. These camps dissolved after World War II, and a growing middle class effected change in the social structure. Prosperity, mobility, and more government benefits in the late twentieth century resulted in a higher standard of living for nearly all Austrians. There are more middle-class citizens than any other group, and education is considered the means to upward mobility. Equality is promoted throughout Austria, although foreign workers, immigrants, and Gypsies are still generally less accepted by the middle class. Symbols of Social Stratification. An older Austrian family lineage and inherited wealth are still symbols of respect in Austrian culture. Austrians whose families have lived in the country for several generations gain more acceptance than those who are recent immigrants. Symbols of wealth today may be a second home and more material possessions, rather than land, as in earlier centuries. Many Austrian cities feature a pleasing blend of "Old World" charm and modern convenience. executive, and a judicial branch. The bicameral legislature is known as the Bundesversammlung (Federal Assembly). It is composed of the lower house of parliament, the Nationalrat (National Council), made up of representatives from the political parties, and the upper house, the Bundesrat (Federal Council), representing the nine provinces. Each of the nine provinces has a provincial government that provides for enforcement of federal laws and policies, and sets laws regarding municipal affairs, education of young children, tourism, and other local matters. Leadership and Political Officials. Austria has a federal president, elected by the people, who serves as head of state. The president has the power to appoint the chancellor and members of the cabinet and other government posts, to dismiss members, and even, on rare occasions, to dissolve the Nationalrat. However, governmental power rests chiefly with the chancellor (prime minister) and the cabinet, who write most laws. They in turn are responsible to the Nationalrat, which must approve all their actions. Members of the parliament are elected by the people. From 1945 until 1986, two major political parties, the Social Democratic Party of Austria (SPO) and the Austrian People's Party (OVP) worked together in democratic governance of Austria. As traditional political alliances broke down in the late twentieth century, however, more "floating" voters made it possible for smaller political party candidates to gain a higher percentage of the vote. These parties included the controversial Freedom Party of Austria (FPO), a right-wing party headed by charismatic young leader Jorg Haider. Other, less powerful, small parties are the Liberal Forum and the environmentalist party, the Greens. In February 2000, the OVP and the Freedom Party formed a coalition, causing the European Union to impose sanctions against Austria because of Haider's alleged racism and Nazi sympathies. Austrians demonstrated to protest the EU's interference in its national politics. Haider stepped down from the party, and the EU lifted its sanctions in September. Social Problems and Control. Austria has traditionally been a peaceful nation with a low crime rate. Police and the law are respected, but since the 1980s some security personnel have been accused of improper conduct and excessive use of force. A variety of political beliefs are tolerated in Austria, and Vienna has long been a center of peace talks between foreign nations and a meeting place for international organizations such as the Organization of the Petroleum Exporting Countries (OPEC). As a result, violence and terrorist attacks have occasionally broken out against visiting members of nations in conflict, although involvement of the Austrian army and tough sentencing of terrorists by Austrian courts have curbed such incidents. Austrian police divisions are the Federal Police, whose jurisdiction includes Vienna and other urban areas, and the Gendarmerie, responsible for rural and all other areas of Austria. The State Police is a national secret service division. The criminal court system hears cases of crimes and misdemeanors. Jail and prison sentences tend not to be lengthy, and an effort is made to rehabilitate those incarcerated. Certain acts, such as vagrancy and prostitution, have been decriminalized at the federal level but may still be prohibited by local governments. Military Activity. On 26 October 1955, Austria, by constitutional law, declared its permanent neutrality. It is prohibited from entering into military alliances, and foreign countries are prohibited from establishing military bases on Austrian soil. However, Austria's military does participate in some United Nations peacekeeping missions in other countries. Although it remains a neutral country, Austria is prepared to defend itself from attack with the Bundesheer (Federal Army), which has an air force but no navy. Military service is on a conscript and volunteer basis. Austrian women have never served in the military. Main objectives until the 1990s were to deter outside forces from crossing Austria in military campaigns against surrounding nations by defending Austria's "key zones" (major routes of military advance) and "area security zones" (remaining Austrian territory). The Austrian security policy was restructured from 1993 to 1995, under the New Army Structure, which focuses on resolving border crises that might occur during instability in neighboring nations, resulting in an influx of refugees. Austria accepted observer status in the Western European Union in 1995 and participates in the North Atlantic Treaty Organization's (NATO) Partnership for Peace. It is a long-standing member of the United Nations, the Council of Europe, and the Organization for Security and Cooperation in Europe (OCSE). Austria has one of the world's most highly developed and inclusive social welfare programs, funded by direct and indirect taxes. Benefits include unemployment pay and disability, retirement, and survivor pensions. Health insurance is required by the state and covers 99 percent of Austrians. Workers pay into these plans, but the poor and disadvantaged receive equal benefits. Parents receive many benefits, such as monthly support payments for maternity and paternity leave and child maintenance payments for children, from birth through completion of higher education. Unwed mothers and large low-income families receive additional benefits. Austria owes much of its success to its Social Partnership, which brings together farmers, employers and employees, and trade unions. Trade unions and professional groups help gain rights for Austrian workers as well as helping to regulate economic and social matters. Unions use collective bargaining to help set wages and salaries and worker benefits. Professional groups serve to regulate quality of services, pricing, and competition within the professions. Agricultural groups work to improve farming methods and promote production. The major nongovernmental economic organizations are the Austrian Trade Union Federation; the Federation of Austrian Industrialists; the Federal Chamber of Trade and Commerce (or Federal Economic Chamber); the Conference of Presidents of the Chamber of Agriculture; the Regulation of the Professions; and the various chambers of labor, which are public corporations, whereas trade unions are private, volunteer organizations. Membership in a chamber of labor is compulsory for all workers. These organizations work together and with government through a representative council called the Parity Commission, which sets general principles for solving economic problems. Since the late 1980s, the Social Partnership has been criticized for lack of concern over the environment and for social groups that are not represented, such as pensioners, students, and many women. Catholic Action is the main lay organization of the Roman Catholic Church. Austria's many sports organizations are affiliated with the Austrian Federal Sports Organization. Division of Labor by Gender. In spite of efforts to equalize the workforce, a majority of Austrians still consider it women's work to do household chores, cook, and care for children. A growing number of men in younger families help with child care, cooking, and shopping, however. Austrian women hold jobs outside the home less frequently than do women in most other European countries. Except for those with college degrees, women are under-represented in business and the professions and generally hold jobs that require less education and fewer skills. Women make up only about 40 percent of government workers. The Relative Status of Women and Men. Since the mid-1970s, the Austrian legislature has passed a number of measures aimed at equalizing the treatment of men and women in the workforce. However, most women are still paid less than men for doing the same type of job. The Women's Omnibus Law, passed in 1993, provides for compensation for women who have been discriminated against in the workplace because of their gender or who have faced sexual harassment. The Equal Treatment Law of 1979 has continued to fight discrimination against women. Austrian men, especially among older and rural families, are still considered the head of the family. Men have compulsory military service and work in industry, farming, trades, and professions. Austrian men face stresses from uncertain areas, however, as evidenced by their uncommonly high suicide rate. Marriage. Austria saw a boom in marriages from 1945 through the 1960s, a golden age for the economy. Today, however, fewer young people marry, more couples divorce, and more live together and raise children without marrying. More women are opting for having a child but not marrying. Couples marry later in life, and many educated women choose their profession over a family. No-fault divorce was legalized in the 1980s, and divorce has increased, especially in urban areas. Most weddings are still held in a Roman Catholic Church, although religion plays a lesser part in the lives of urban residents in the late twentieth century. Domestic Unit. The domestic unit varies in Austria. Added to the basic unit of husband, wife, and children are households with a single parent and child, homes of divorced or widowed women and men, single professionals, and households where a man and woman live and raise children outside of marriage. Households in rural areas are still usually conventional, with married couples and several children and possibly grandparents and other relatives living under the same roof. Inheritance. Inheritance of farms varies according to region, with the most common practice being the passing of the property to one son. Remaining siblings then receive cash for their share of the property. In other areas, one heir receives the house and a large share of land, with the rest divided among other family members. Infant Care. Infants are well cared for by Austrian parents, with both mother and father allowed paid time off from work when a child is born. Families in urban areas tend to be small, and each child receives plenty of attention. In larger farming families, siblings and other relatives may be available to help care for infants. Most infants receive a traditional baptism in the Roman Catholic Church. A house in the small town of Kaprun. 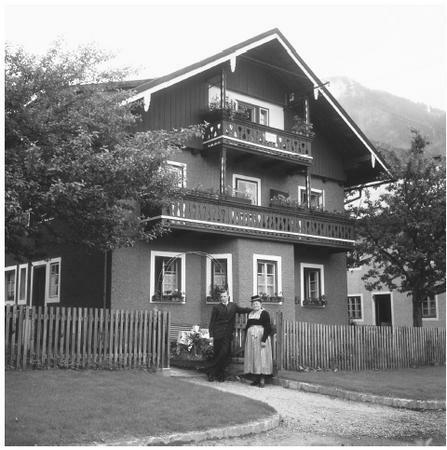 Many rural areas of Austria are dominated by farmhouses that have been in families for years. payment each month to help provide for children. This continues until the child completes college or vocational training. Parents of handicapped children receive double payments, and thousands of children receive free school lunches. Children's holiday programs are organized by the government, and disabled children receive special training. Austrian children are raised to reflect the Austrian community spirit of peace and compromise as a means of resolving conflict. They are taught to respect others and to appreciate the arts, their beautiful environment, and their heritage. Austria's education system is one of the world's best, and Austria has a literacy rate of 99 percent. All children have an equal right to free education, with free transportation to and from school and free textbooks provided. Schooling is coeducational and is compulsory through the ninth grade. Between ages six and ten, all children attend a primary school. After age ten, children are separated through a "two-track" system in which some students attend a general secondary school for four more years, and the remainder attend an upper-level secondary school until age eighteen. The decision about which secondary school to attend was once made by children and their parents immediately after primary school, but education reforms since the 1980s have made this decision more flexible, resulting in a larger percentage of children choosing the upper-level schools. Debate over the two-track system continued in the 1990s. After secondary school, students have the option of attending a university or a vocational school to pursue a specific career. In addition to public schools, the Roman Catholic Church also operates primary and secondary schools that make up about 10 percent of Austria's schools. Higher Education. Students who graduate from upper-level secondary schools may apply to a university. Austria has twelve universities and six fine arts colleges. The University of Vienna, founded in 1365, is the oldest in German-speaking Europe. A university education is free for Austrians, although foreign students pay tuition. Once available only to wealthy males, university training is now available to all Austrian students who pass an entrance exam. As a result, since the 1960s annual enrollment at universities has increased from about 19,000 to 200,000. Women account for about half of the university students, although nearly all professors are male. Most Austrians greet one another formally, by shaking hands and saying, "Gruss Gott" (greet God) or "Gruss dich" (greet you). Upon leaving, they shake again and say "Auf Wiedersehen" (good-bye). Older Viennese men may kiss the hand of a lady on introduction, or say "Kuss die Han" (I kiss your hand) and click their heels together. Women enjoy having doors opened for them. When dining, everyone at the table joins in a toast, saying "Prost," and "Guten Appetit" is exchanged before beginning to eat. The formal titles Frau (for a woman) and Herr (for a man) are universally used. Religious Beliefs. Freedom of religion and worship is guaranteed in Austria. About three-fourths of Austrians are Roman Catholic. Many Austrians practice "baptismal certificate Catholicism," in which they are Catholic by baptism and religious formality but do not hold Catholic beliefs on central issues. Another major religion in Austria is Protestantism, and many foreign workers are Muslim or Serbian Orthodox. There is also a small community of Jews, mostly post World War II immigrants and their families, although the Jews have a long history in Vienna, beginning in the tenth century. Religious Practitioners. Catholic priests, Islamic teachers and mosque officials, Protestant ministers, and Jewish rabbis make up the majority of religious practitioners. Rituals and Holy Places. Cathedrals and churches are found throughout Austria. One of the most magnificent cathedrals in Austria is Saint Stephen's, or Stephansdom, in Vienna, built during the fifteenth century. The Augustinian abbey and the statue of Saint Florian in the town of Saint Florian are also important religious sites. Cathedrals contain carvings depicting the life of Christ, at which worshipers stop to pray. A number of monasteries of the Cistercian order of monks, founded in the twelfth century, still function. A popular pilgrimage and tourist destiny is Melk, a Benedictine monastery on the Danube River. In the countryside, crucifixes are erected at crossroads, and numerous wayside shrines offer a place to rest and pray. Death and the Afterlife. Austrians rely on the churches for funerals, and most hold to the beliefs of their religious faith about the afterlife. Austria has one of the highest suicide rates in Europe, especially among men. Vienna is the site of the large Zentalfriedhof (Central Cemetery), which contains the memorial tombs of such famous composers as Beethoven, Brahms, and Schubert, as well as a memorial to Mozart. Wealthy Austrians are buried in elaborate mausoleums, but nearly all graves are well tended, with flowers neatly arranged. Austria's health care system is well developed, with 99 percent of its people protected by health insurance plans. These are funded by workers, employers, and the federal, provincial, and local governments. Everyone covered by health insurance is entitled to free outpatient and inpatient treatment. Physicians contract with health insurance agencies but are free to maintain private practices, and patients are free to go to the doctor of their choice. Cardiovascular diseases, cancer, cirrhosis of the liver, and accidents are the major causes of death. Life expectancy for newborn males in 1998 was 74.3 years, and for females 80.7 years. Major celebrations include Fasching, a Carnival celebration held the week before Lent begins, and the Almahtrieh, a September celebration of the return of herders from Alpine pastures, in which cows decorated with ribbons and bells are led into town in a procession. Austrians also celebrate National Day on 26 October; Independence Day, 12 November; Nikolo (Saint Nicholas) Day, 6 December; New Year's Day, 1 January. Support for the Arts. The arts are highly respected in Austria, and Vienna was known during the eighteenth and nineteenth centuries as a world center of culture, especially in music. It was home to some of the greatest classical composers, including Haydn, Mozart, Beethoven, Schubert, and Brahms. During that time, the Habsburg family and the Roman Catholic Church were chief supporters of the arts. Austria is sometimes known as "the Land of Music." Annual festivals throughout the country feature Austrian orchestras, choirs, and other groups. The best known is the Salzburg Summer Festival, founded in 1920. Austria is famous for its Vienna Philharmonic Orchestra and Vienna Boys' Choir. The Vienna State Opera is a state institution that supports Austria's premier cultural home, the Vienna Opera House, one of the most opulent in the world. It accommodates Austrians on a budget by providing standing room on graded aisles with rails to support viewers during a long opera. Austrian children have compulsory music and art classes in primary and secondary schools, and private music schools and conservatories abound. Provincial theaters and orchestras bring the arts to rural and town dwellers. The arts are responsible for stimulating a large portion of the tourist trade in Austria as well and so are considered excellent investments for private supporters. Literature. Because it is written in German, Austrian literature is often considered a part of German literature, and the first significant literature in German appeared in Austria in the form of epic poems and songs around 1200. Seventeenth-century minister Abraham a Sancta Clara wrote prose about the social classes that left a permanent mark on Austrian literature. Adalbert Stifter was the best-known fiction writer of the nineteenth century, and Rainer Maria Rilke was a gifted philosophical poet of the twentieth century. Several Austrian writers wrote plays and operas in addition to verse and fiction. Among them were Hugo von Hofmannsthal, who, with innovative dramatist Max Reinhardt, annually produced the mystery play Everyman at the Salzburg Festival. The works of early-twentieth-century novelists Franz Werfel and Franz Kafka are world famous. Well-known interwar novelists are Heimito von Doderer and Robert Musil. Thomas Bernhard and Peter Handke achieved fame in the late twentieth century. Coffeehouses, especially in Vienna, have long been known as a gathering place for writers and poets. Today, many coffeehouses feature literary readings as part of the culture that makes them so popular. Graphic Arts. As capital of the illustrious Habsburg Empire, Vienna was a center for the fine arts as well as for music and the theater. Realist painter Ferdinand G. Waldmuller and painter Hans Makart were the most famous of the nineteenth century. Gustav Klimt painted in the unconventionally sensuous "secession" style, founded in 1897. Oskar Kokoschka painted the realities of World War I. In the twentieth century, artists such as Herbert Boeckl painted ornamentation on residential blocs and cathedrals. Anton Kolig and Josef Mikl were abstract painters, and Ernest Fuchs and Anton Lehmden were known for "fantastic realism." The Albertina museum in the Hofburg quarter of Vienna houses a world-famous collection of graphic arts, featuring prints, drawings, and water-colors by artists such as Michelangelo, da Vinci, Rubens, Cezanne, Manet, Modigliani, and Schiele. Performance Arts. Religious drama flourished, especially in Tirol, during the Middle Ages. During the Counter-Reformation, Jesuit priests wrote countless religious dramas and staged plays at Jesuit schools. Vienna became the center for German-speaking drama during the 18th century. Vienna's Burgtheater was the most eminent during the nineteenth century, when playwright Franz Grillparzer's plays were first performed there. Social dramas, folk farces, and satires also premiered during the nineteenth century. Around 1900, the Vienna School of dramatists, led by Austrian playwright Arthur Schnitzler, created a new style of playwriting in Europe, featuring psychological drama. The Salzburg Festival showcases drama as well as music. The sciences are well developed in Austria, and every effort is made to stay in the forefront of research and development, especially with Austria's entry into the European Union in 1995. Research is divided into science-oriented and business-oriented research. Science research is carried out mainly by the universities, whereas business research falls under independent companies and private and state-funded research institutes. Among Austrians winning the Nobel Prize in the sciences are Julius Wagner-Jauregg (1927, therapy of paralysis); Erwin Schrodinger (1933, physics); Wolfgang Pauli (1945, "Pauli Principle" in quantum theory); and Konrad Lorenz and Karl von Frisch (1973, behavioral science). Famous psychologist Sigmund Freud (1856–1939) did most of his work in Vienna. Austria participates in the European Space Agency, The European Council for Nuclear Research, the European Molecular Biology Laboratory, the Organization for Economic Cooperation and Development (OECD), and the United Nations Educational, Scientific, and Cultural Organization (UNESCO). Although Austria has pledged not to acquire nuclear weapons and its voters declined the adoption of nuclear energy, Austria is the headquarters for the International Atomic Energy Agency as a center for research and negotiations. Austria in Pictures. Rev. ed., 1991. Berenger, Jean. A History of the Habsburg Empire: 1273 1700, translated by C. A. Simpson, 1994. Brook-Shepherd, Gordon. The Austrians: A Thousand-Year Odyssey, 1997. Jelavich, Barbara. Modern Austria: Empire and Republic, 1815 1986, 1987. Ladika, Susan. "Europe's Unsettling Immigrants." The World & I, 1 May 2000, p. 70. Robertson, Ian. Blue Guide: Austria, 1992. Solsten, Eric, and David E. McClave, eds. 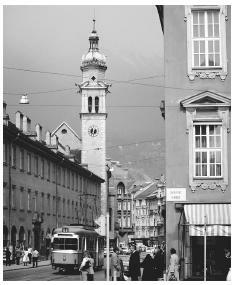 Austria: A Country Study, 1994. Sully, Melanie A. A Contemporary History of Austria, 1990. Sweeny, J., and J. Weidenholzer. Austria: A Study in Contemporary Achievement, 1988.
a very cool summary of austria which i'm doing a project about that. Thanks i needed this! In doing a project on Austria at the momnet and theirs nothing else i could find on the net! good sumary on austria!! i was looking for about half of this information including the map!! Is there a summary that is available? Research immitation style needed for Culture class. This helped me alot on my project. I got an A 100%. thank you so much for the info you provided. I can finishing my homework..
and i though this info would be hard to find!!! thank you soo much! I am part Austrian. I did a report on Austria once. It was very interesting. I got to learn about their culture, food, history, arts, religion, and what the people do for fun. Like snow sports for example. They love to ski. This is the same info i got for my report! nice website! I always see movies about other countries on televion, on school we had to learn about foreign countries, but I was really curious about, what other people learn about "my" country. It is really funny to read about all that, what we live every day! For sure every person also here in Austria is individual and you can`t generalise them all, but I think you give a really good summary! Best wishes from the mountains of Tirol! awesome, i'm doing a project about them and this will really help! it was my best time of during life when i was in Austria. thank you for your complete information which help me to collect my logbook. Hey thanks for the information! I'm doing a project in class about Austria- this really helped, thank you! why do austrian men when speaking english pronounce got as gat? -You have it that Austria still uses the Schilling. -Also, I would like to know why Austria has one of the highest suicide rates...but that is something for a google search perhaps! -Overall, thank you for your article and in my opinion, Austria is the most beautiful country in the world! Thank you so much for the information, it was brilliantly written and very helpful. Thanks for the info! it helped for a powerpoint project at school! I just found a cassette from 1983 of my grandmother (who is now deceased) giving an oral history of her life. She said her parents emigrated to America from a town in Austria called something that sounded like "Sutulov" ? Does this town still exist and where is it located? I live in Austria and love living here. As a young person (mid 20s), I also want to add subjective positive and negative observations of my live here. I'm from Austria! this was for one of my projects at school. Anneonghaseyo! i'm from korea. oh! it really worked alot for my mural project on austria, such abeautiful place? haven't seen yet want to vist! this website really helped me out for my school project and i wouldnt get this done if i hadnt found this wedsite!!! enjoy read this blog... i love so much all about austria but i haven't seen yet, anyone can answer me, what flower that hanging at their (austrian people) balcony house? is that real flower or not? I am from Jakarta, This BLOG is so helpful, I can finish my Thesis Paper. :) Gutten Nacht ,Danke Terima kasih. This website gave me and a+ on my expo project! Thank u so much! Thanks this is going to get me an A plus hell yeah. This website help me so much with my project on Austria. It help me learn things I did not know before. It went in debts in the culture of Austria and help me get more knowledge on what I needed to know. This website is so amazing it helped me so much when I needed to learn about everything in Austria including its their food, their traditions, everything. This website helped me finish my geography project for austria the day before it was due. Just wanted to say thank you very much for your work on this site, I've only recently just found it and it has been really helpful in world building for a novel I'm going to write. Also, I love reading about culture. This website helped me finish my gcsr project for austria the day before it was due. Great summary of Austrian culture. I'm doing research for a 3 month missionary assignment in Vienna. Looks like I'm going to really love the people! I need help finding the clothing section .Apparently they do not have a clothing section that I need for a project . wonderful report it really helped with my school project and it looks like you did a lot of work to perfect the website and the information. This information can stand an update, it may be accurate until the end of the twentieth century. Any changes to the political system, currency and other matters is outdated. It mentions the currency as being the Schilling, but Austria uses the Euro since its inception in 2002. I am an unofficial student of 19th century nobility and royalty. I was looking for info on the Austrian aristocracy, as I understood this country had one of the "snobbiest" upper classes in all Europe. I wondered how things had changed. This article only touched the subject. Fortunately, there's a lot more about the Habsburg dynasties to fill in the gaps.